In a tournament, individual matches are played two out of three points over a two to five minute time period (the length of which is announced before the competition). A scoreless or tied match may be extended at the referee’s discretion. There are also team competitions in which a winner is determined by either the total number of points or the total number of winners. There are four designated target areas, each worth one point in a match. There are strikes to the head (MEN), the wrist (KOTE), the body (DO) and a thrust to the throat (TSUKI). Points are scored based primarily on KI-KEN-TAI-NO-ICHI – Spirit, Sword and Body as one. KI – Spirit or intent – expressed by a yelling out of the intended target (kiai) at the *exact* moment of the strike. It’s not quite like calling your shot in snooker (8 ball, corner pocket), but if you hit the wrist instead of the head and you had intended to hit the head, the strike would not result in a point. KEN – Sword – you must strike with the proper part of the shinai (bamboo sword). This is represented by the area between the tip and the leather tie about 25 cm down from the tip. The leather tie is approximately at the area known as the Monouchi (in Japanese), which I translate as “the sweet spot” in English. If you were swinging with a katana, that are would be the best compromise between blade speed and strength. Too close to the tip, you risk damaging your sword. Too close to the hilt, you don’t get enough speed to make a proper cut. TAI – Body – in the same way a punch in karate packs more power when you move your body into the punch in conjunction with your arms, a proper strike in Kendo requires the body to be moving in the same direction as the cut, and the momentum of the body must be co-ordinated with the strike. This is represented by Fumikomi – a foot “stomp” – which indicates the body’s momentum has landed. 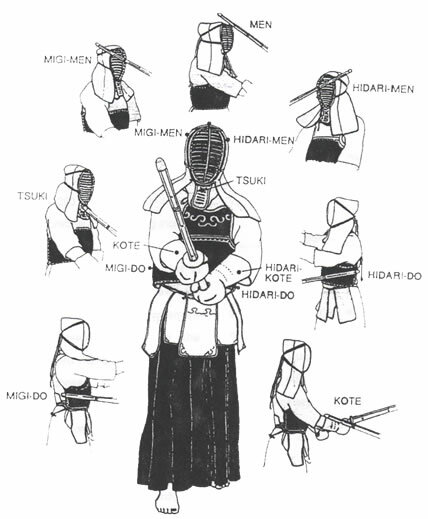 So, if your strike hits with the proper part of the blade, and the strike is co-ordinated with your body’s momentum and if you yell out your intended target area at the moment the strike lands, you will have scored a point in Kendo – most of the time. The referees look for good form and a strong follow through that leaves a player in a position to continue immediately with no letup of spirit. Unnecessary roughness or poor sportsmanship carries penalties. Other variables considered – your level compared to your opponent, your form, your overall spirit, your follow-through after the strike. word is final in all cases although he may on occasion summon his colleagues for a brief conference over application of the rules. Play is stopped after each successful point, to be resumed at centre court on the referee’s signal. Two points scored simultaneously cancel one another however, and the match is not stopped. If two players are locked in a sword guard tangle for too long (TSUBAZERIAI) and there is no sign of impending movement, the referee may stop play and separate them by their swords’ length to start again. If a player is forced out of bounds of drops his SHINAI, a penalty point is called. If a second such foul is called, the player concedes a point to the other player.